Alexander Accountancy in Burton on Trent is a general accountancy practice with a friendly proactive team specializing in providing compliance services, management information and business advice for SME’s. Plus, exit strategy, succession planning and tax planning for business owners. 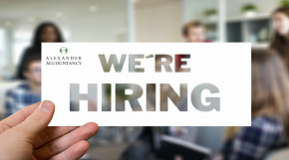 The role requires experience of working in a general accountancy practice and help with training will be considered. Whilst qualifications of AAT or equivalent are desirable relevant experience and ability are more important. The main functions will be preparing accounts and management information to manager review stage for limited companies, partnerships and sole traders, including interactions with clients as required. Completing personal and company tax returns to a draft level for review by the client manager. Complete the bookkeeping and VAT Return preparation for a variety of businesses as required. Oversee and help train junior staff and bookkeepers in the preparation of business records and VAT Returns. Have/develop enough knowledge and understanding to sign off the VAT Returns for submission. Run a small portfolio of payrolls and act as back-up to the payroll manager. Be able to train clients on business software, primarily Xero and QuickBooks, but other systems are used from time to time. The basic hours are Monday to Friday 09.00 – 17.00, however, these are negotiable and can be varied with prior agreement but will be for a minimum of 35 hours per week. The salary will start at £21,000 – £25,000 depending on experience, plus Discretionary Bonuses & Workplace Pension. Holidays are Statutory plus additional days depending on the length of service. Other benefits will be advised at the interview stage. email to david@alexander-accountancy.co.uk or telephone Burton 01283 743851.